Is your car shaking and shuddering? Do you feel like you’re driving off road even though you’re on the road? You may have a wheel out of balance. Contrary to popular belief, wheels and tires are actually round. Their close but any small amount out of round a tire or wheel is can cause all sorts of bad feelings coming through the steering wheel. Elkhart Mechanics can take your wheels and get them back in shape. They will put them on their tire balancer and add wheel weights where needed to adjust the unbalance that is built in to the tire from the molding process. Once your tires are balanced again you’ll notice a huge difference the ride and steering ability of your vehicle. Wheel balancing is making sure that all of your tires and wheels are of equal weight. It often consists of adding weights to the lighter parts of the wheel to make them equal the weight of the heavier parts. Signs that your wheels are out of balance include feeling vibrations in the floorboard, seat, or steering wheel, especially when the car is moving above 50 miles per hour, and seeing certain types of wear on the tires. Imbalanced front wheels cause vibration in the steering wheel, while imbalanced rear wheels cause vibration in the seat. Tires that are out of balance often display a cupped or scalloped pattern of wear. Some wheel imbalance is caused by lug nuts of unequal weights, so wheel balancing includes adding weight to the lighter lug nuts. Front wheels that are out of balance can even cause the steering wheel to wobble visibly. In extreme cases of imbalance, the entire car can wobble, which causes stress on the car’s suspension. The balance of your tires can be measured by testing them on a static balance machine or dynamic balance machine. In some newer cars, the anti-lock braking system contains wheel speed sensors that can detect tire imbalance fairly accurately. Until recently, most of the weights used for tire balancing were made of lead, but the Environmental Protection Agency has expressed concern about workers and drivers being in contact with so much lead. In recent years, other materials, such as zinc, have been used to made lead-free weights for wheel balancing. 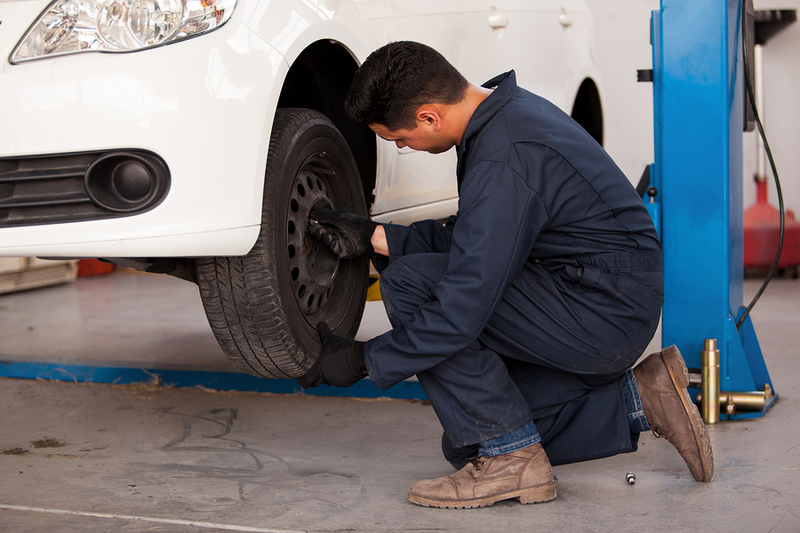 When you bring your car in to have the tires rotated, we can check the wheel balance and adjust it if necessary. Wheel balancing is not a substitute for wheel rotation, since even if the wheels are balanced, front tires and right-side tires still wear out more quickly.